Have you ever wondered what families in third world countries or far back in history did for diapers? I have until I received the National Resource Defence Council’s “This Green Life” in my inbox. 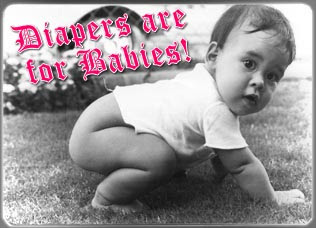 In North America, we assume diapers are a normal part of infancy and toddlerhood, but it doesn’t have to be that way. Having a diaperless babe works like this, “The method goes by a variety of names: elimination communication, natural infant hygiene and infant potty training, though the last is spurned by many who say there is no training involved. Whatever it’s called, it boils down to this: the parent looks for the signals (hand-clenching, grunting, squirming, a look of inner concentration, etc.) that the baby regularly shows in advance of having to go, then takes the infant to the pot, sink or potty, and makes a special “cuing” noise — for instance, “sss” — to signal back that it’s ok to proceed. Soon the baby makes the association. The family now has a communication system that can be used to avoid messes most of the time”, according to “This Green Life” writer Sheryl Eisenberg. Furthermore, she equates it to potty training a puppy. I find this idea very interesting, but it is too late for our toddler. If you are a diapering family, cloth diapers are a good solution. We also use Seventh Generation disposables (or landfill diapers as my midwife calls them) for overnight (I got tired of pee on my sheets) and trips. Great site! I just followed a link here – I forget where from – but I’m glad I did! Come check us out if you like – we also review parenting items, some green, some not so much but 99% by par.entrepreneurs. Love your site too; thanks for sharing. We will have to get one of the peace t-shirt (too bad we missed the contest).